Christmas will be here before you know it, so it’s time to start thinking about that fabulous holiday dinner! Instead of the stuffing I make for Thanksgiving, I like to shake things up and serve this Sage and Sausage Cornbread stuffing recipe instead. 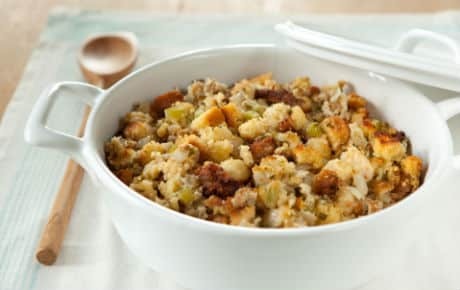 Inspired by Ina Garten’s Cornbread Stuffing, the unique flavor combination is amazing and it’s made with delicious ingredients that are quite satisfying. It goes great as a side dish with a roast turkey, chicken or Christmas ham. Put this decadent Christmas Cornbread Stuffing recipe on your dinner table this year and your family and friends will enjoy an amazing meal without even knowing that it’s a healthier version. Looking for a tasty Christmas Stuffing Recipe that the family will love, but will still keep you on track to meeting your Weight Watchers goals? Well this healthier version of the Barefoot Contessa’s Sage and Sausage Cornbread Stuffing Recipe is not only delicious, it’s low in Points too. Preheat oven to 325°F. Coat a 9-by-13-inch baking pan with cooking spray. Cook sausage in a large nonstick skillet over medium-high heat, stirring and breaking up with a wooden spoon, until browned, about 10 minutes. Add apple, mushroom, onion, and celery; cover, reduce heat and cook, stirring occasionally, until tender, about 10 minutes. Transfer the mixture to a large bowl. Season with salt and pepper. Add cornbread, parsley, and sage. Bring water to a simmer in a small saucepan and add the butter and bouillon. Pour 1 cup over the stuffing mixture and toss gently (the cornbread will break into smaller pieces). Add as much of the remaining broth as needed, 1/2 cup at a time, until the stuffing feels moist but not wet. Spoon the stuffing into the prepared pan and cover with foil. Bake the stuffing until thoroughly heated, about 25 minutes. Serve warm.